It’s finally here. The chocolate cake of your dreams. A HEALTHY chocolate cake. Or at least a healthi-ER chocolate cake. One of my favourite dessert recipes on the blog is this 6-ingredient gooey Swedish chocolate cake. 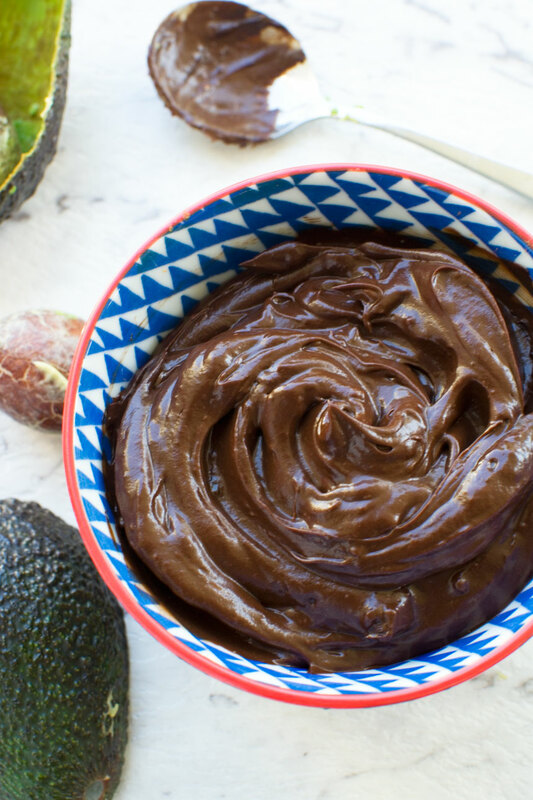 It’s oozy, super chocolaty heaven, and I’ll continue making it, especially when I need a delicious crowd pleasing dessert in a hurry. It isn’t exactly the healthiest of things to eat, is it now? Yes, chocolate cakes really can be healthier! It never occurred to me to try making a healthy chocolate cake before now. I guess I assumed it couldn’t possibly be as delicious as an ‘unhealthy’ one. 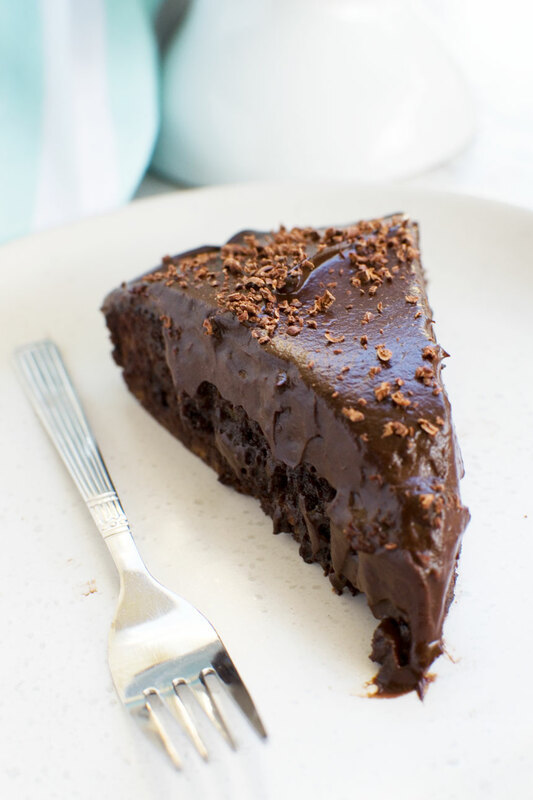 THIS healthy chocolate cake is delicious too. I’m not going to say it tastes exactly the same as the 6-ingredient gooey Swedish chocolate cake, because that wouldn’t be true. But it’s still good. Lick the plate clean sort of good. So how do you make a healthy chocolate cake? Could this healthy chocolate cake get any better? 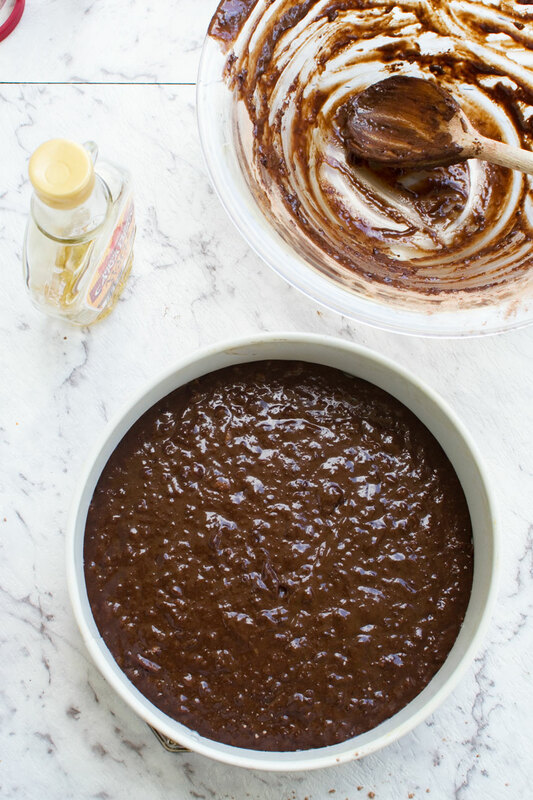 Not only is it healthier than a regular chocolate cake, it’s quick and easy to make, too. Even the sweet potato part is easy. I just cook a medium sweet potato in the microwave until soft, then I split open the skin and scoop out the flesh. It mashes really easily with a fork, or if you’d prefer to get it completely smooth you could pulse it for a few seconds in your food processor. I’m cheating a bit by calling this a 30 minute cake because of course you need a bit of extra time for cooling and adding the frosting. But essentially you can make this cake in just half an hour. Make the frosting while the cake is baking. Then you only need a few more minutes to add the frosting once the cake is cool. So what does a healthy chocolate cake taste like? I agonised a bit over what to call this cake. Healthy chocolate fudge cake? 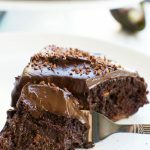 Healthy chocolate mud cake? Healthier chocolate cake? But it isn’t exactly fudge cake, and it isn’t mud cake either. It’s kind of something in between, and the exact texture varies a bit depending on how long its in the oven – or the particular oven you have. The first time I made it, it was a bit less gooey. Still delicious and moist, but more like a regular cake-y chocolate cake. But the true magic happened the next time I made it. I took it out of the oven a bit sooner, and I slathered it in a healthy chocolate mousse frosting / ganache. And it was perfect. IMHO. 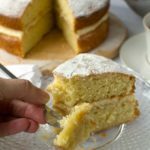 Had mixed results with healthy cake recipes? This is a keeper for me! So deliciously gooey & chocolaty… without the guilt! 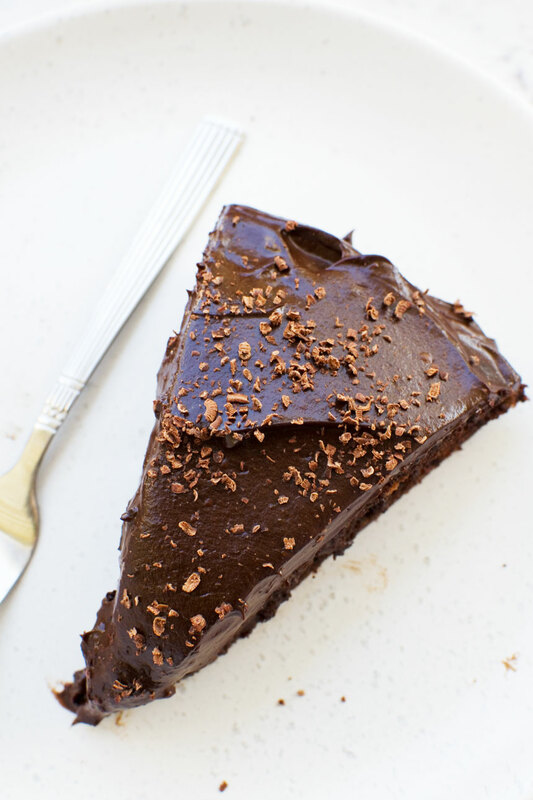 This healthy chocolate cake reminds me of a retro Sara Lee chocolate gateau (remember those?). The thick chocolate mousse ganache tastes very similar to the Sara Lee version, but of course it’s much healthier. Does it taste of avocado? Hmmm. If you close your eyes and think about it, yes. But I don’t mind. I really like the rich, clean, super chocolaty taste and the smooth mousse-y texture. You could even serve this frosting by itself as a chocolate mousse. 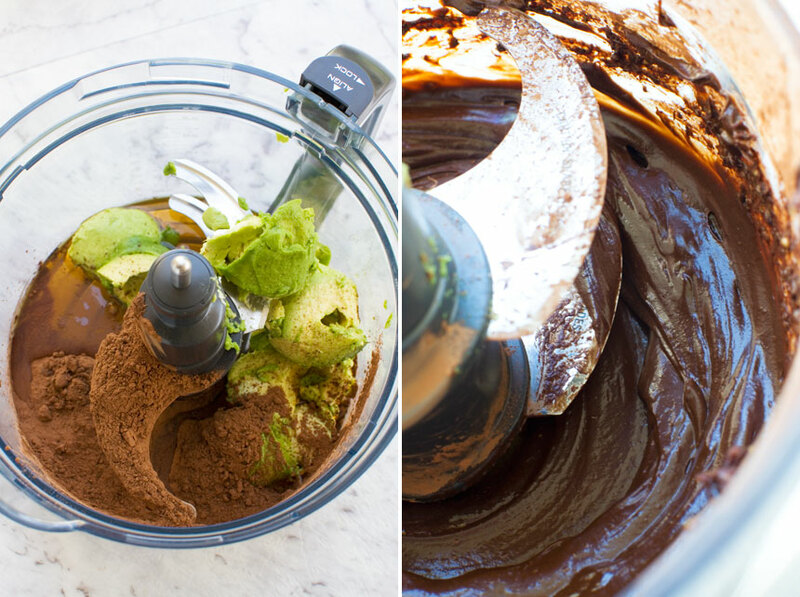 Or use it as a healthier topping for brownies or cupcakes. Spread it on thickly… it tastes as good as it looks! 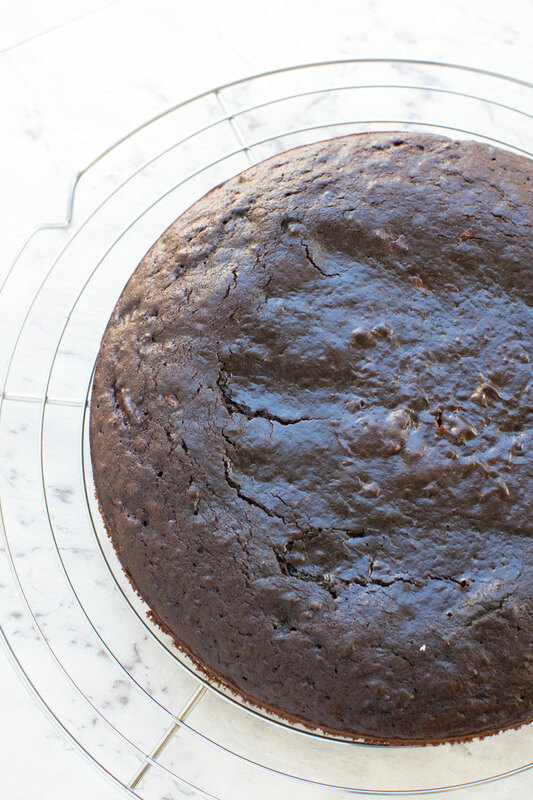 So there you go – healthy chocolate cake! If you’ve been searching for healthy cake recipes, maybe the search is over! I give you permission to enjoy a piece (or two) of this without an ounce of guilt. Can you freeze this healthy chocolate cake? I expected the cake part to freeze just fine, but I assumed the avocado ganache part wouldn’t. But it does! When defrosted I really couldn’t tell the difference from when it was fresh. I froze it in the middle of a large container with a lid (so that the ganache didn’t get all over the sides!) and it was fine. You might find it easier to freeze without the ganache, though. 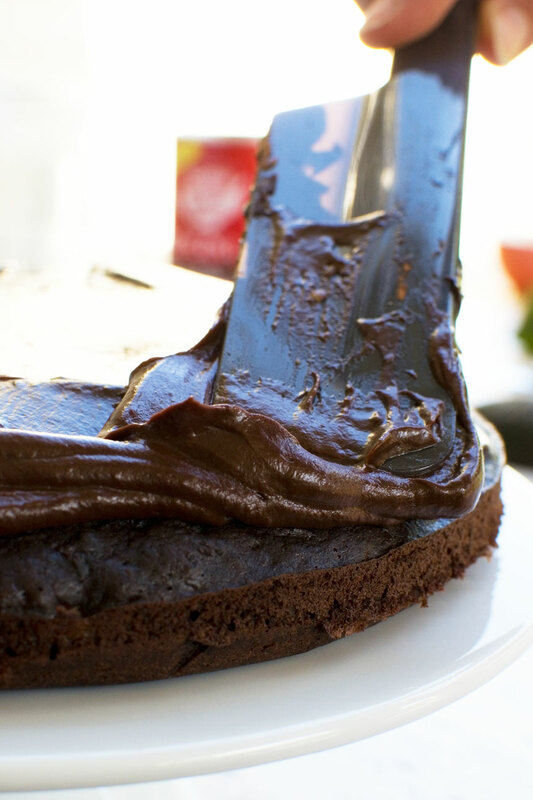 Make the cake, then whip up the quick ganache just before serving. I’m absolutely delighted to have discovered such a delicious (not to mention quick and easy) version of one of my favourite foods, and I hope you like it as much as I do! It’s here. The chocolate cake of your dreams. 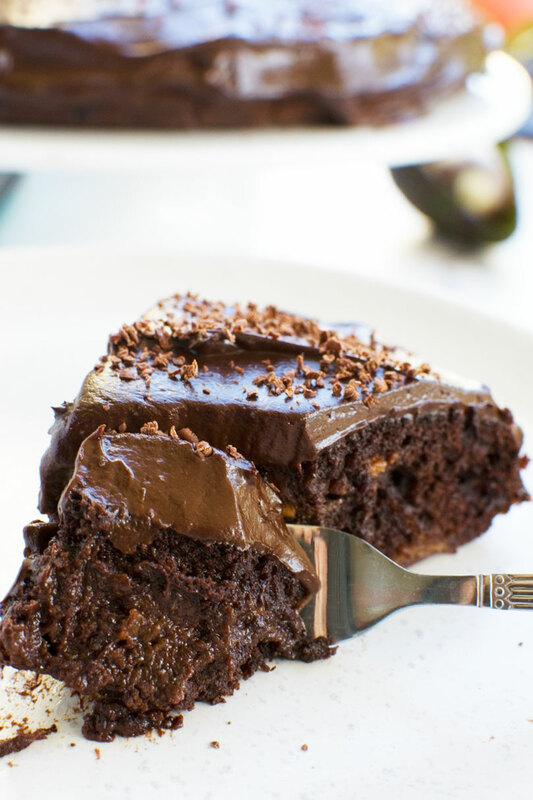 A healthy chocolate cake stuffed with superfoods including sweet potato, cocoa and avocado. Made with only 8 main ingredients. What are you waiting for? Line the bottom of a 9 inch round cake pan with a circle of baking paper and spray the pan all over with a light coating of oil. Preheat the oven to 355F/180C. Pierce the sweet potato all over with a fork, then place on a plate or kitchen towel and microwave on high for 6 to 8 minutes until the flesh is soft. Cut open lengthwise and scoop out the flesh. Mash it well in a medium bowl or jug (or pulse in a food processor for a few seconds). Let it cool a little. Combine the flour, cocoa powder, salt & baking soda in a medium bowl. 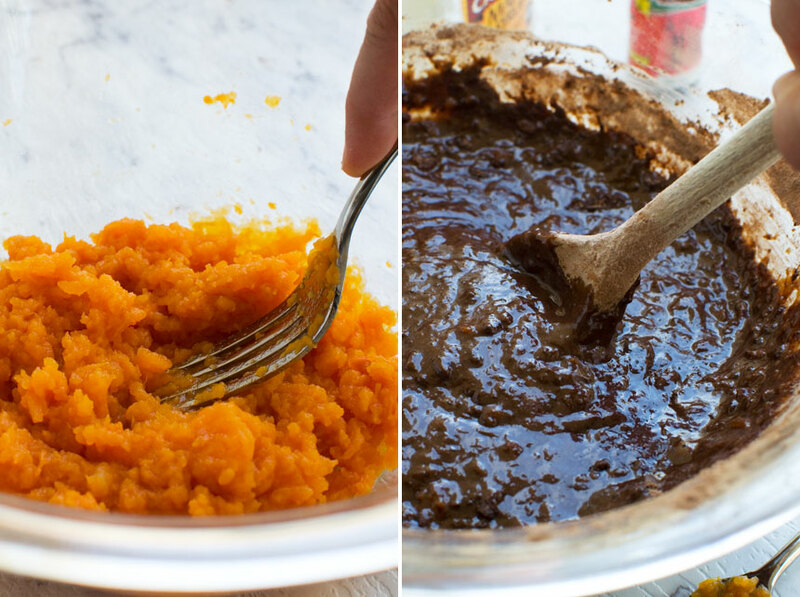 Add the eggs, vanilla, oil and maple syrup to the sweet potato and mix well with a wooden spoon. Add to the dry ingredients and mix again until well combined. Pour the batter into the prepared baking pan and bake for 18 minutes or until the top is just cooked and the centre is still a bit gooey. Let cool for 10 minutes in the pan, then carefully turn out onto a wire rack to cool completely. 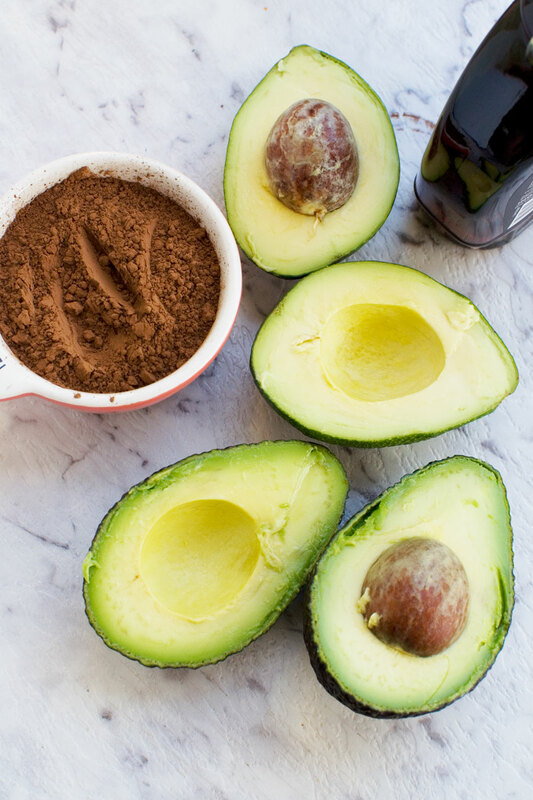 Pulse the avocado, cocoa and maple syrup in a food processor until silky and smooth. Once the cake is completely cool, spread the frosting thickly all over the top and sides. Once you’ve practised making this cake a couple of times, it will only take 30 minutes from start to finish. You have to add a bit of time for cooling/frosting, of course! When I first made this cake I cooked it for about 20 minutes and it was delicious but not at all gooey in the middle. I found that by reducing the cooking time a little (to 18 minutes in my oven) the centre stayed just a tiny bit gooey! Yum! You want the top to look totally cooked, but when you insert a skewer into the middle of the cake it’s still a bit sticky. If your cake isn’t gooey, don’t worry. When you top the cake with the ganache, it’ll kind of sink into the cake a bit and make it super moist. Am I making you hungry? I use a medium sized sweet potato and find that it nearly always makes about a cup of mashed sweet potato. If there’s any left over, simply freeze it for next time! Make sure your sweet potato is nice and soft before scraping out the flesh. If it isn’t after 8 minutes in the microwave, just cook for another minute or two. Cooking time will vary according to the size of the sweet potato you use, of course! This cake freezes really well. Just wrap well until you’re ready to defrost and eat. I’m not sure that I will be making that awful looking cake (I’m trying to convince myself that it is awful) so not being rude. What I am sure about is ……….. I do want to wish you and yours a Very Merry Christmas (I know, it doesn’t feel like Christmas weather for you) and every best wish for 2019. Thank you, Ann! I’ll take that as a compliment…. hahaha! Thank you so much for the good wishes, and I wish you and yours a very happy Christmas and New Year too. Thank you so much for your support this year – it means so much! Have a wonderful Christmas with your family, Helen, and very best wishes for the new year. Looking forward, as always, to next year’s recipes. For me, you consistently come up with some of the most tried and tested and well thought out recipes on the internet which I know I can always rely on every time. Thank you so much for all the effort you put in to produce them and present in such a delightful way. Hello Pauline! Merry Christmas to you too! This is one of the loveliest comments I’ve read all year. Thank you so much for the encouragement! My recipes definitely aren’t perfect, and I doubt myself often, but I’m so happy to hear that you like my work and find it reliable. That’s probably the biggest compliment I could ever receive! It’s so great to get some positive feedback, and I really hope you enjoy next year’s recipes as much as this year’s. Please don’t hesitate to make any suggestions/special requests. I really value your support! OH my! 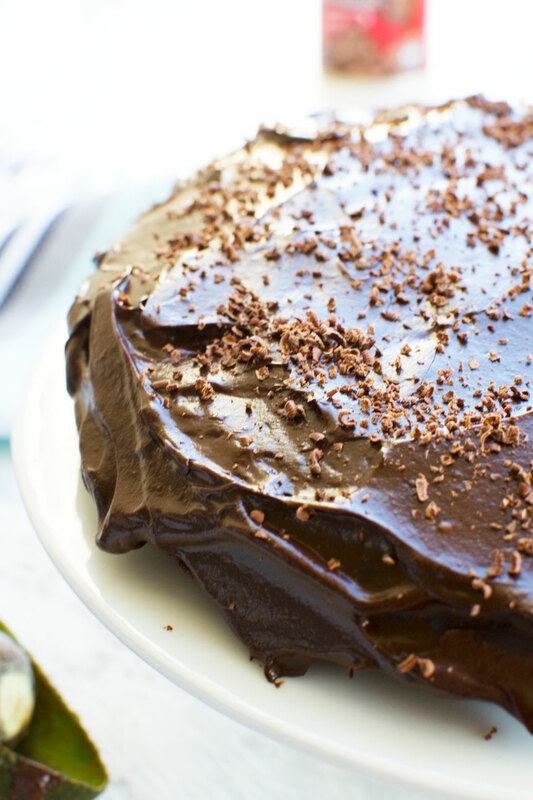 This chocolate cake looks amazing and so moist! There is no way that I would able to only eat one slice! Guess its a good thing its healthy right?!?! Yes, that’s the problem. I suppose it’s possible to eat too much of something healthy! Thanks for the review, Tisha! 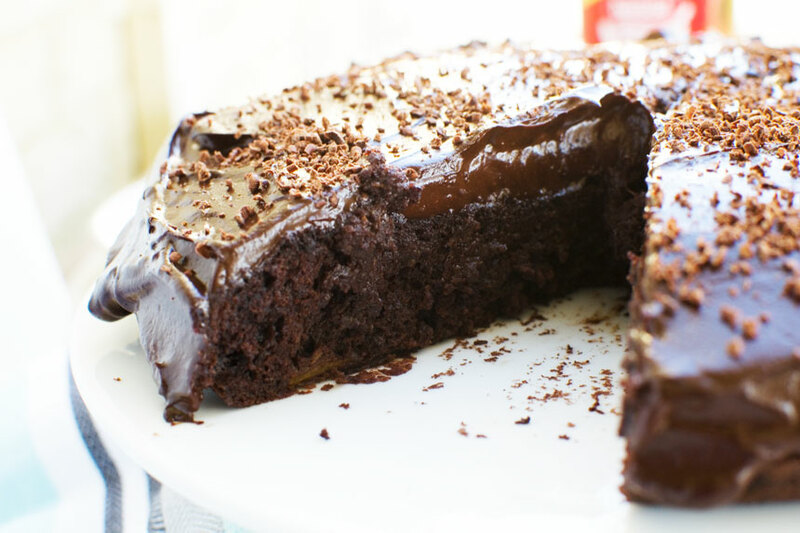 Chocolate cake that is ready in 30 minutes AND healthy?! HECK. YES. 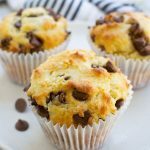 It seriously looks so rich and moist – I love all the “secret” ingredients you added to it! Saving this recipe in my back pocket! Hi Jenni. 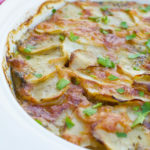 So glad you think this recipe is worthy of a save! Happy Christmas! Can i use golden sugar instead of maple syrup for frosting? Hi Rita! I’ve never tried adding anything other than maple syrup, but I don’t see why you couldn’t try. Let me know how you get on!